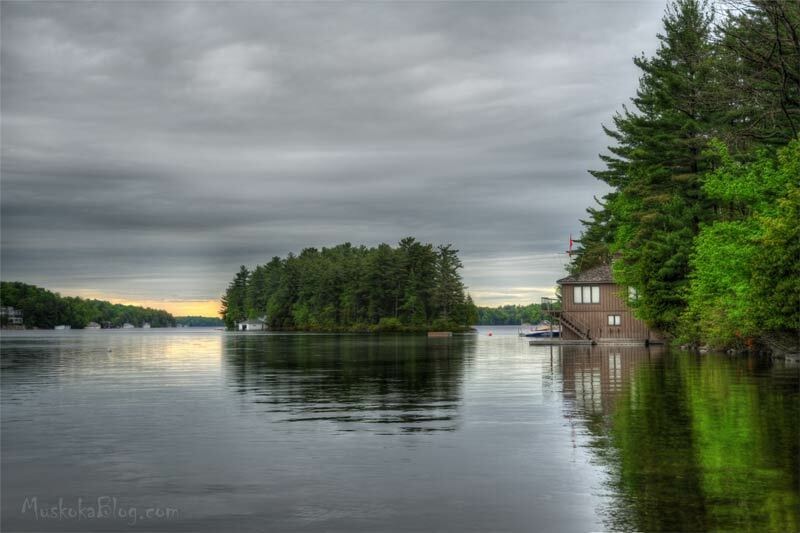 This is Cox Bay on Lake Joseph which is not far from Port Sandfield in Muskoka. You can see how much the water level has dropped, maybe down about a foot. 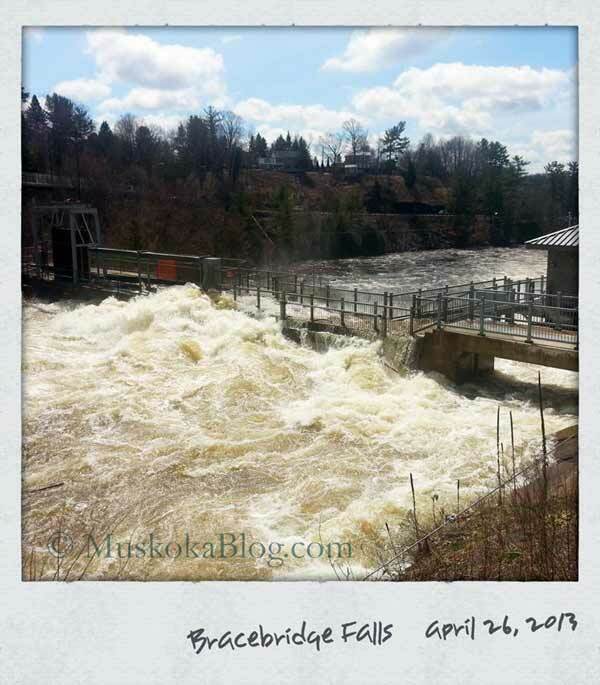 I believe this is in anticipation of the spring melt. Please click on the image or HERE for a much larger sized photo. 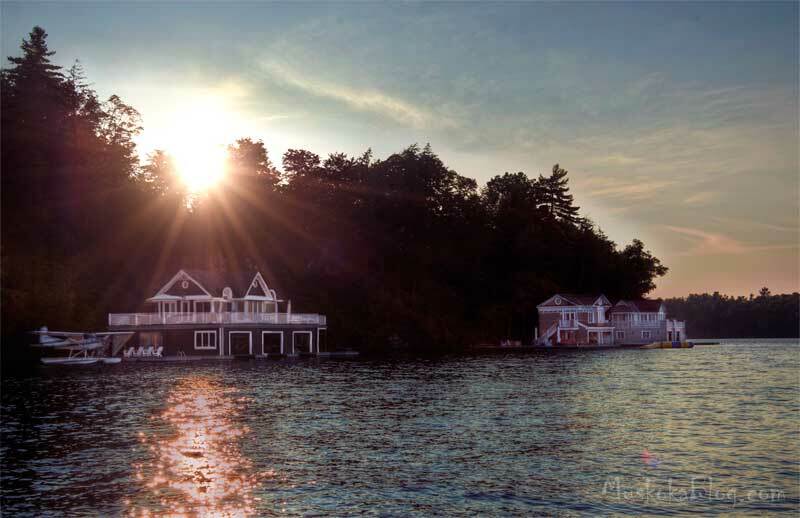 Boat houses on Lake Rosseau in Muskoka. 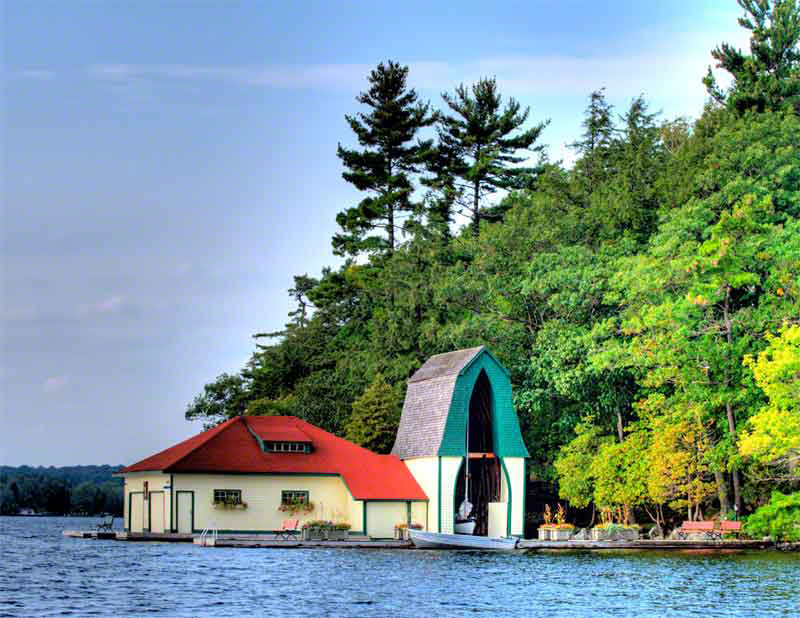 One of the key attributes of Muskoka are the numerous boathouses nestled in on the shorelines. I don’t believe there is anything else like this in the world. 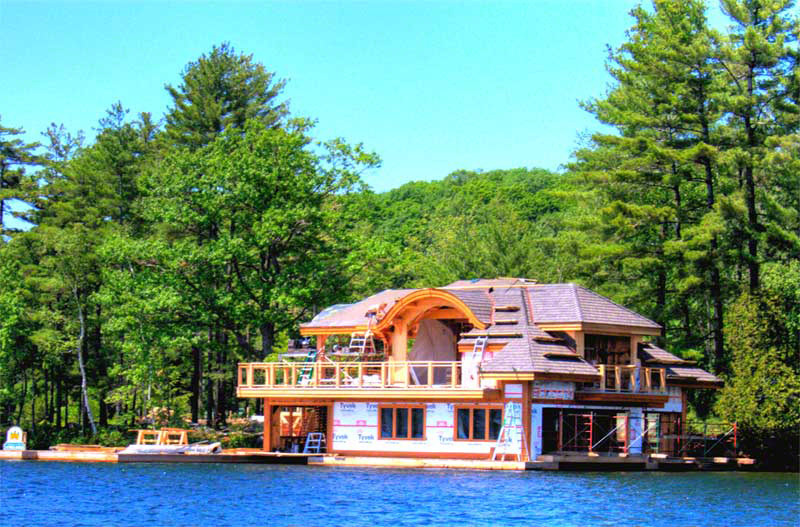 They can range from little one slip shacks to gigantic mansions with helicopter pads. Many of them offer a deep and interesting history. Whether its a summer home to a previous US President, Hollywood movie star, designs by a famous architects or a property that dates back to the 1800’s they are all interesting to see. 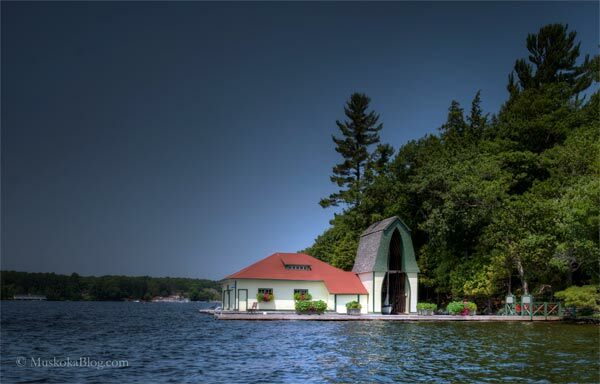 People are always asking to see more of these boathouses so I will make an attempt to include them as I travel throughout the lakes. 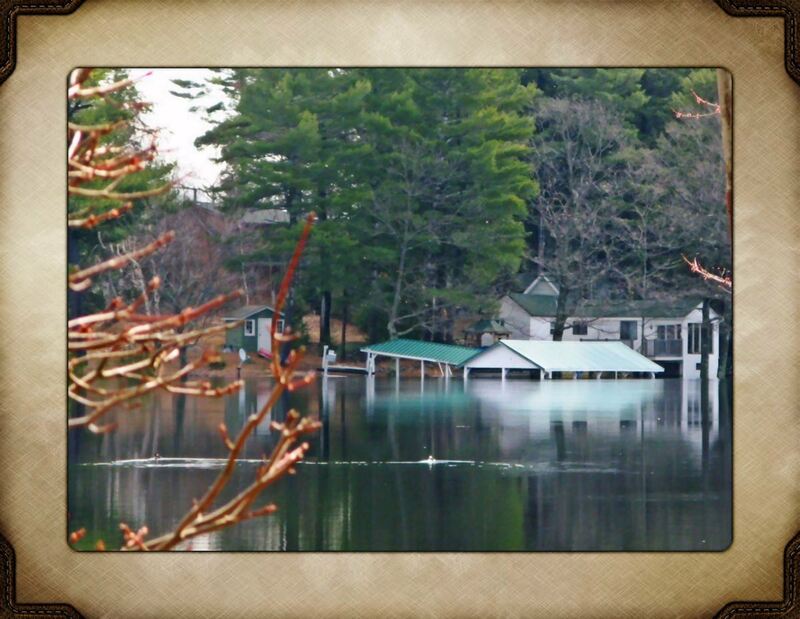 Its surprising how many new boathouses you will notice after the ice thaws. 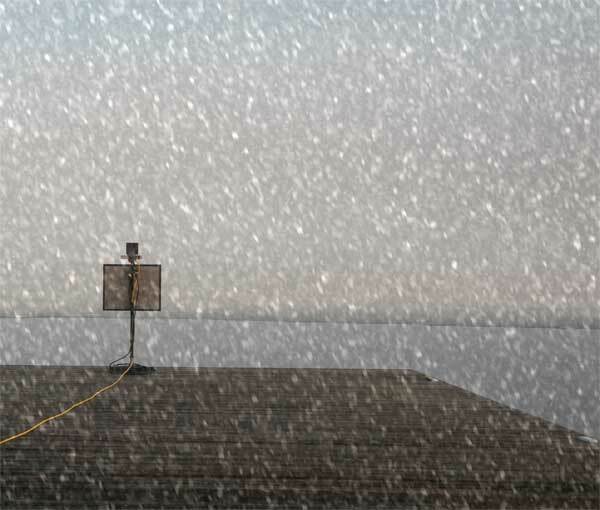 Building boathouses during the winter time is easier and also provides for employment in a time of year where everything is usually dead quiet. 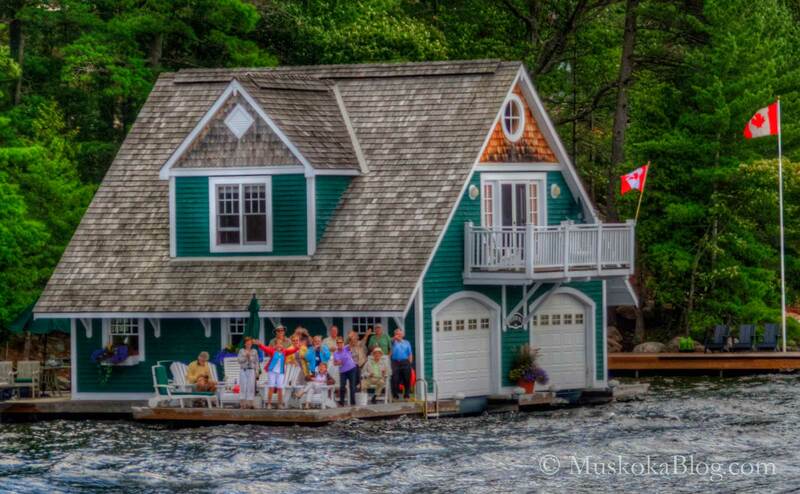 Muskoka is world famous for its boathouses. Here is an example of a new one going up on Lake Joseph as you head north out of Port Sandfield. The ice-out bubblers and illuminated warning signs are installed. 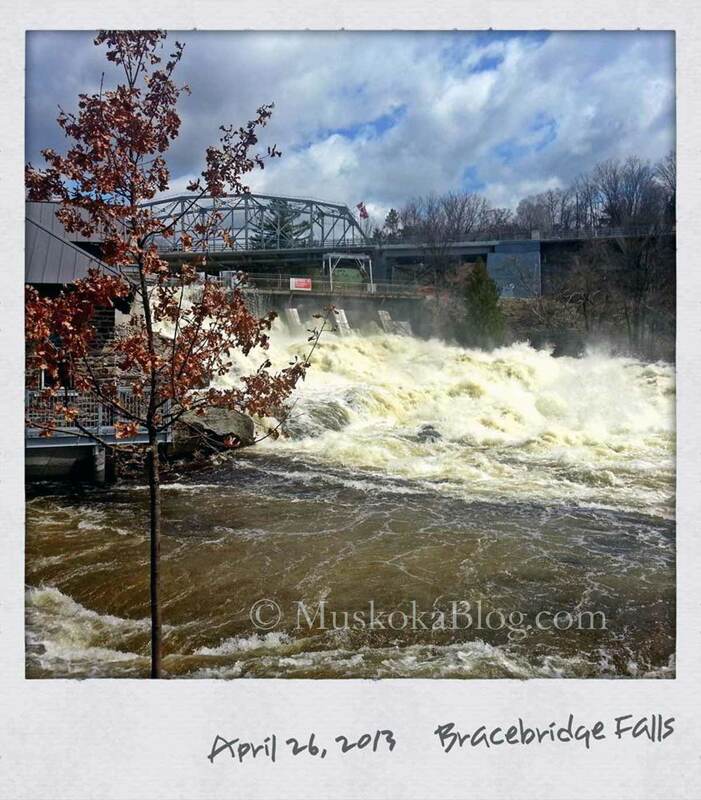 I noticed the water levels to be high for this time of year. 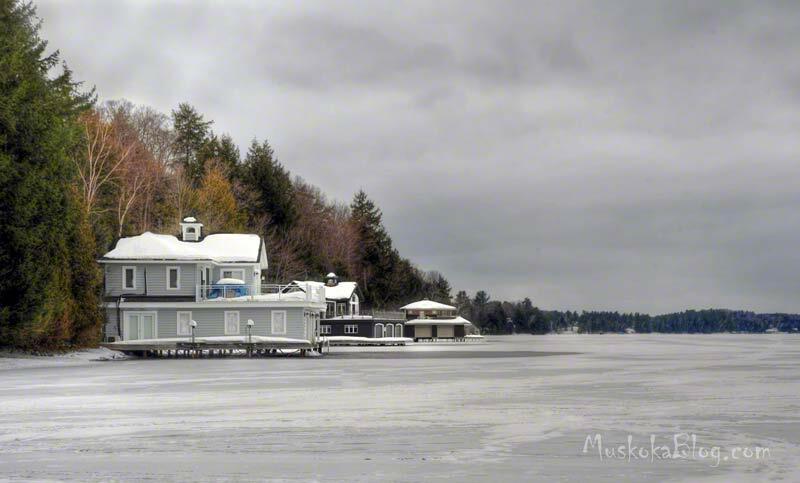 I like to have the ice cleared from forming around boathouses and docks. The Ministry will drop the lake levels on some lakes at some point leaving tons of ice hanging which can cause serious structural damage. Sledders and people out on the ice need to be properly warned of these open and dangerous areas. 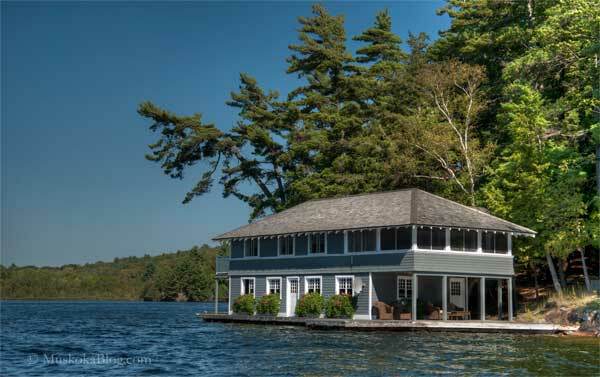 There is without question some beautifully designed cottages and boathouses on the Muskoka Lakes. Here is a photo of a newly built boathouse on Lake Joseph across from the Lake Joe Club in Port Sandfield. It is built on one of the lots that were created from the tear down of the historic Marygrove or Glen Home Hotel. 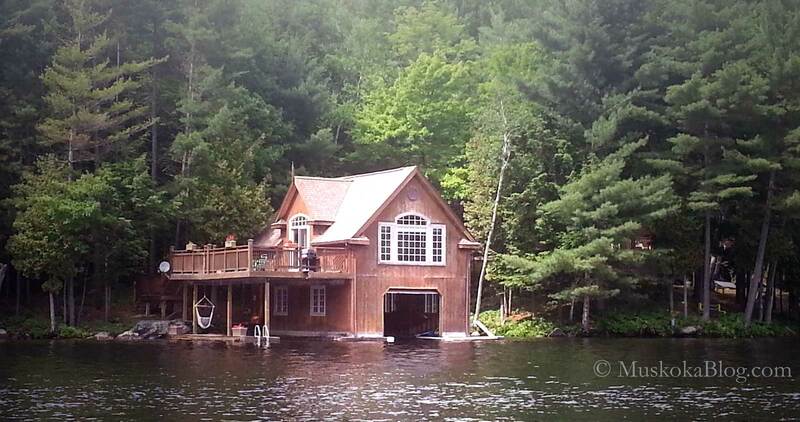 I would like to thank the owners of this boathouse, whomever you are. While traveling down the Joe River recently with a group including kids we got caught in a wicked thunder, lightning and torrential rain storm. It came upon us so quickly with the lightning blasting around us! The wind and rain blew so hard I couldn’t dock the boat so I ended up jumping in the lake and pulling the boat in. Just as we landed another boat arrived with 4 teenagers that were visibly shaken. Fortunately the boathouse was open as we waited for the storm to clear. Someone from the cottage came down later to see if we were OK. Our apologies for the intrusion and thank you for the shelter! Out on the water I had a difficult time finding fall colors since the shorelines are predominately lined in mature conifers. While passing through Port Sandfield I noticed this small bay dotted with boathouses with a semblance of color. 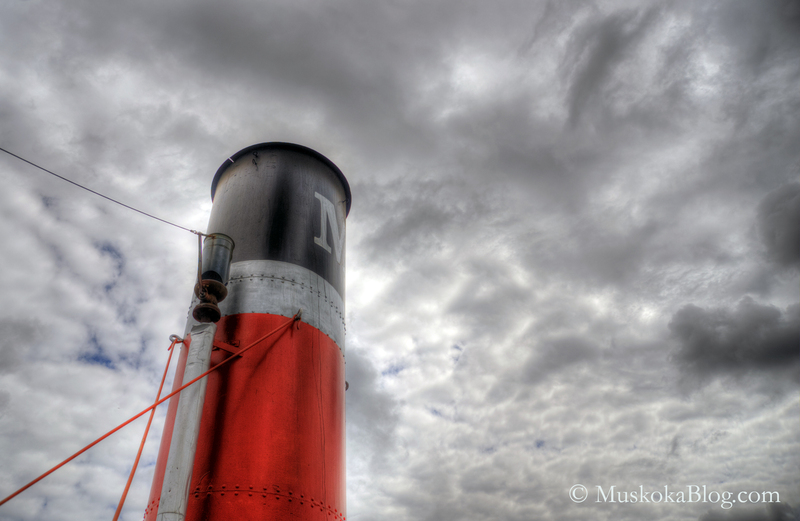 Shooting with an ultra-wide angled Nikkor 14-24 lens produced this panoramic type shot. Please click for a larger 2048p sized photo. Is Muskoka the Hamptons of the north? 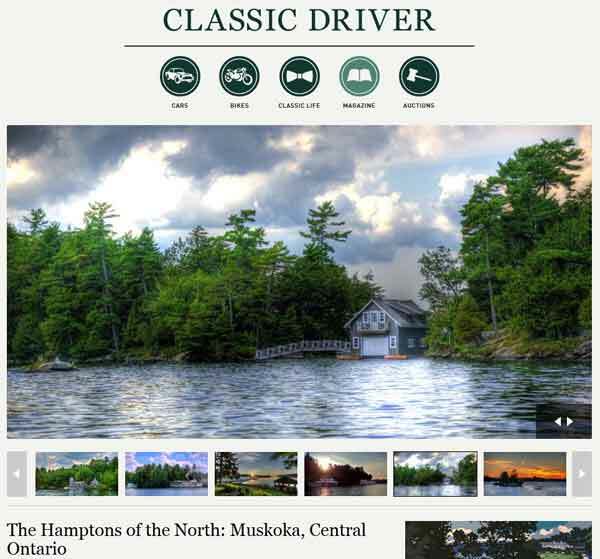 I recently gave permission to a website called Classic Driver to use some of my photos for an article they published about Muskoka. The article goes on to suggest that Muskoka is the Hamptons of the north. 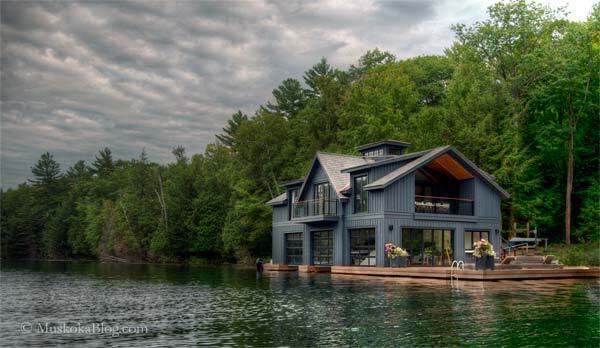 I guess in some ways people see Muskoka in this capacity with the extravagant lake houses and boathouses on the big three lakes. 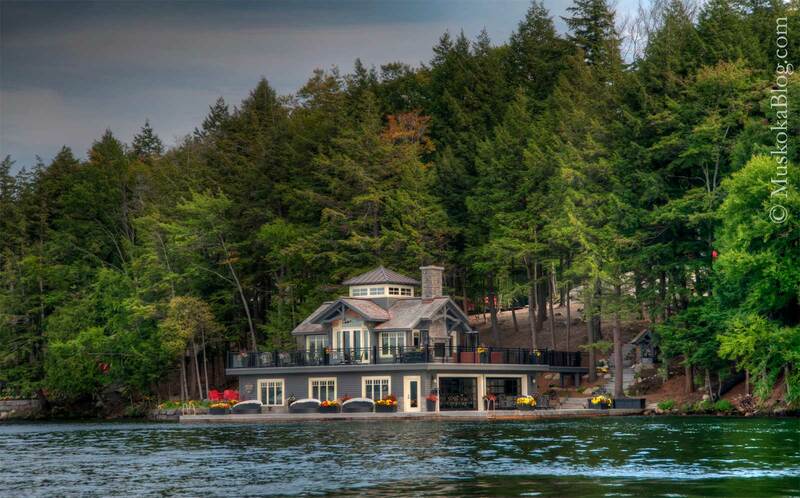 Having a few celebs, sports stars and wealthy business people is only a tiny part of Muskoka. They are here amongst the many thousands of others because they enjoy the natural beauty and all it has to offer. I certainly don’t see people hunting for celebrities with cameras in hand and hope I never do. 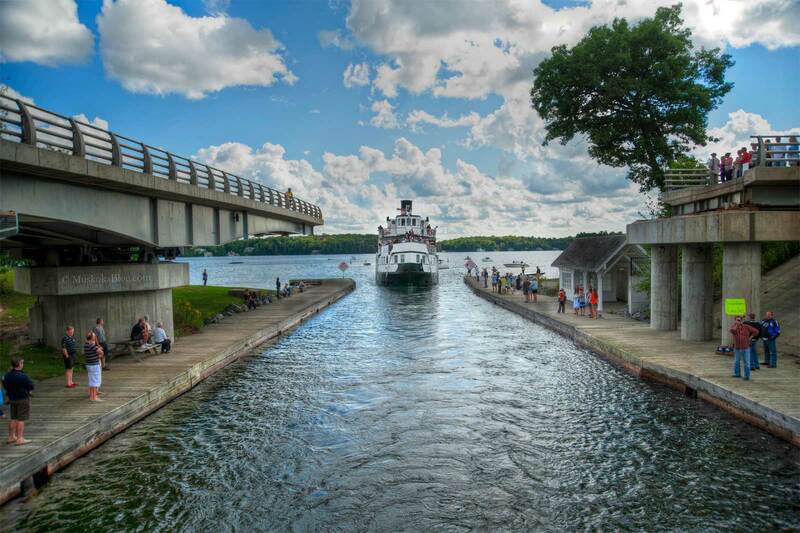 This past weekend I had the privilege to board the RMS Segwun steamship and take part in the 100 Mile Cruise. 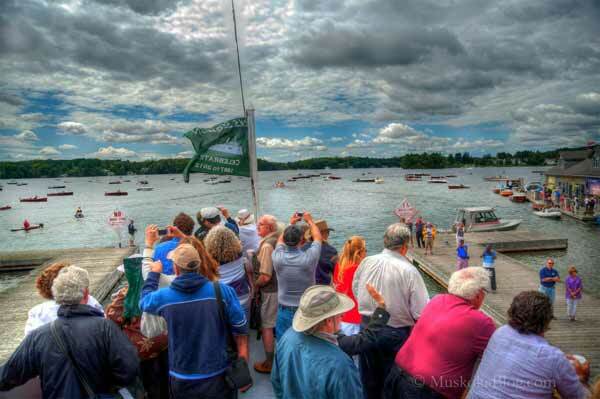 This historic event was the highlight of the summer in Muskoka and will provide enduring memories for many years. Here are a few pics of the journey which departed Gravenhurst at 8:30am and returned 12 hours later. Please click on each photo to get a 1600 pixel shot. 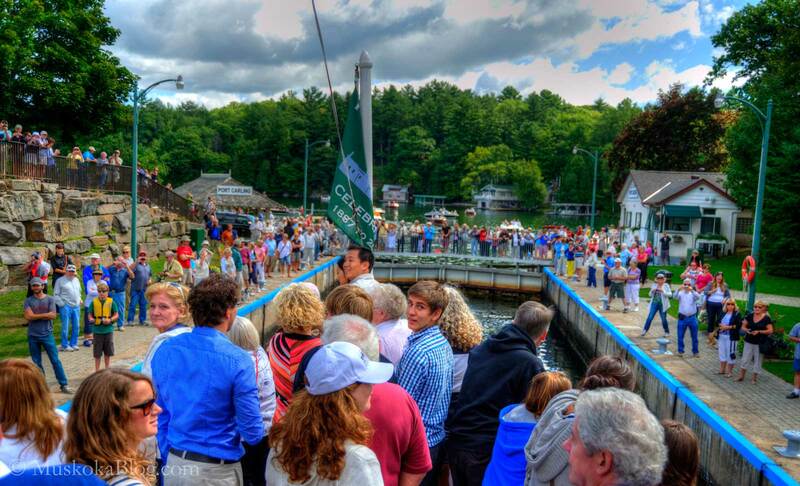 There was a very large crowd waiting for us as we entered the Port Carling locks. 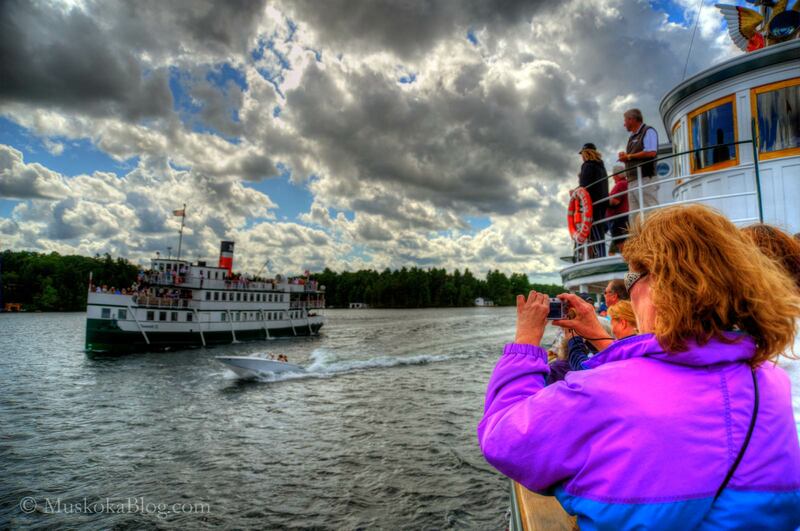 The Wenonah II steamship was following closely behind us. 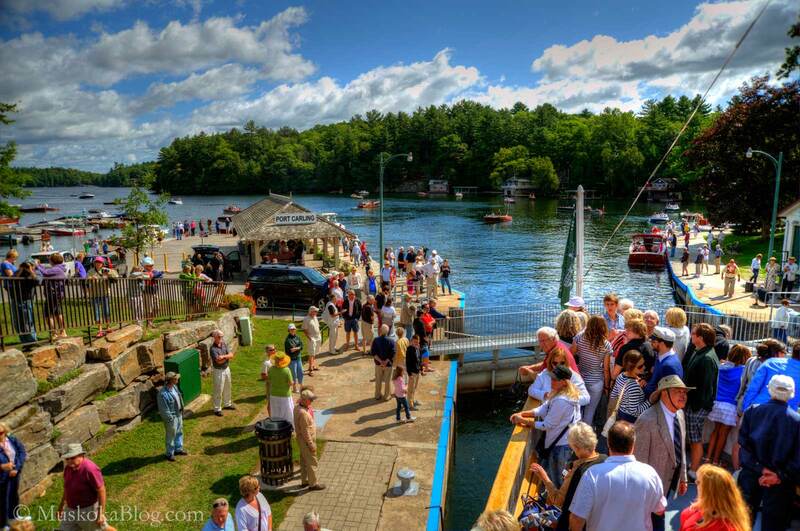 Looking out from the Port Carling locks to the Lake Rosseau side. There were many cottages and boathouses crammed with people cheering us on as we passed the shorelines. Arriving in Port Sandfield at the swing bridge was astounding with more large crowds greeting us and taking photos. As we passed through the channel you could see an amazing flotilla of wooden boats waiting to join us. This is the Wenonah II passing through Port Sandfield with other boats starting to tag along for the journey. 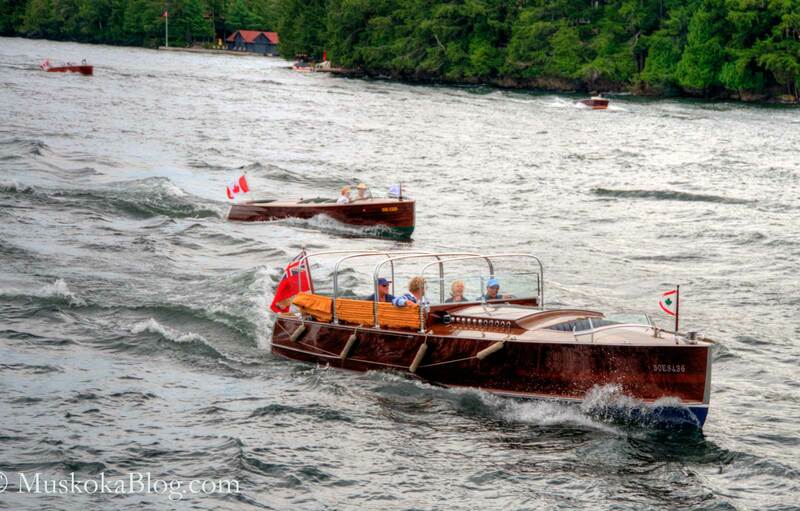 A large number of the most beautiful vintage boats toured alongside of us. It was breathtaking to see just how many there were. Unfortunately I was not able to recreate the scale of it through photos from one ship. When the aerial photos come out you will see how grand the entire event was. Take me to your Captain. 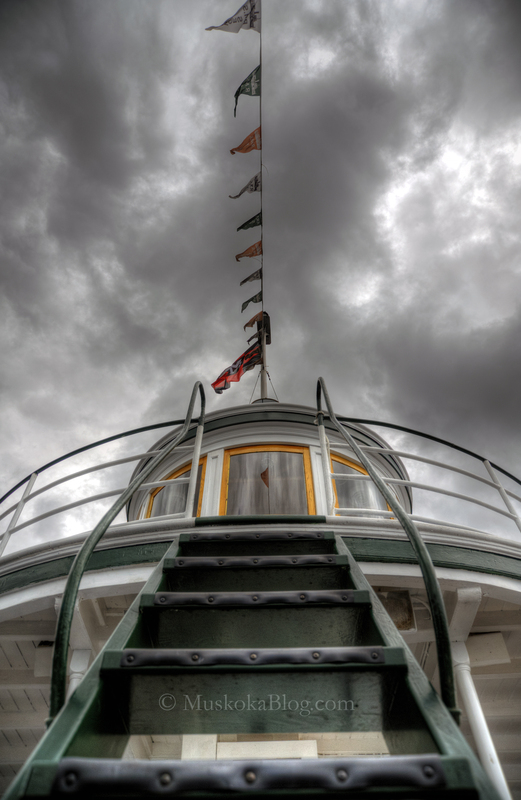 I had the opportunity to go up on the bridge and visit the Captain and navigator. Very cool people with nerves of steel. The final destination was up on Little Lake Joseph. I was surprised the route we took as I have often taken my own boat through here and you need to be very careful of the shallow water. I had heard the Captain had spent the day before testing depths for this journey. At the end of the Bay in Little Joe is a large cliff once called the Natural Park where the steamship would stop and let people out for a walk. Today it is private property. At this point the entire flotilla of boats jockeyed around the two steamships while helicopters zoomed bove taking aerial footage of this remarkable event. 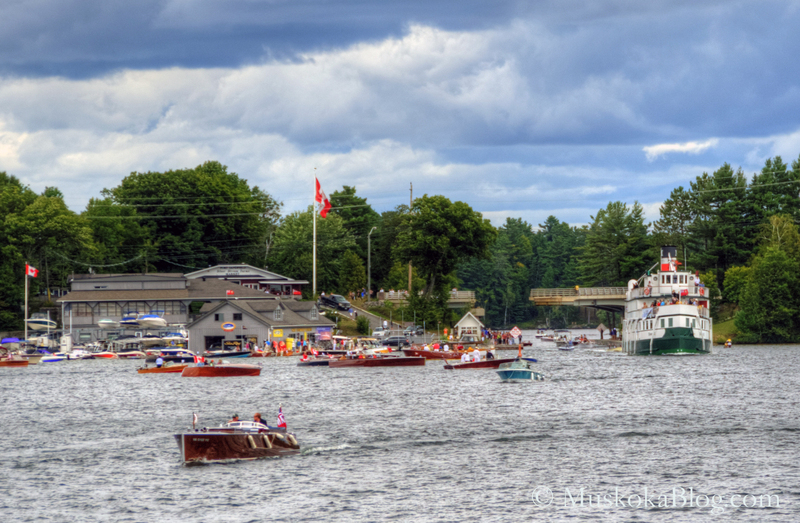 I shot this photo off the bow of the Segwun as we passed through Port Sandfield heading back towards Port Carling in the late afternoon. We were just about to be called to the dining room for a great dinner. The RMS Segwun returning home after a very long day. I’m just glad I didn’t have to shovel the coal. 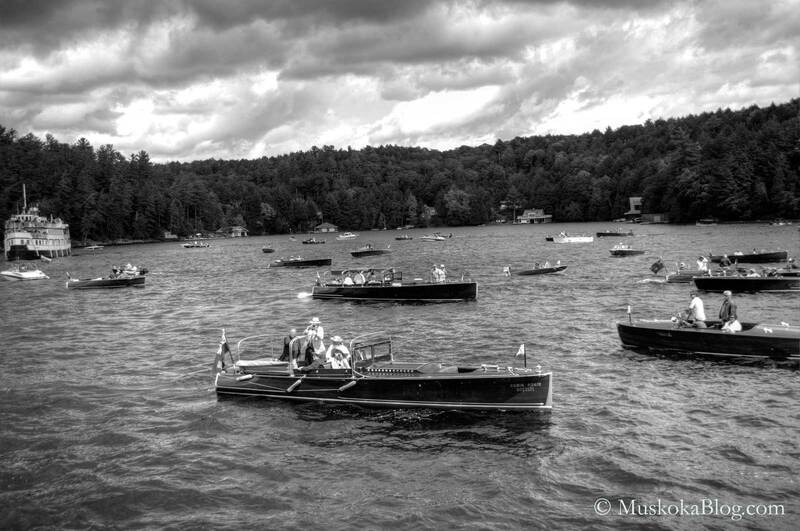 With the recent extreme temps I have been spending quite a bit of time on the water. 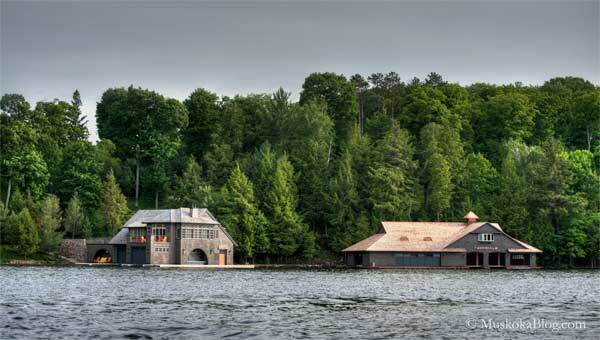 While driving up the eastern side of Rosseau I spotted this interesting boathouse on a magnificent point of land. Each and every cottage and boathouse in Muskoka has a story behind it. The family history, the architecture, who has owned it, etc. I don’t know anything about this one other than it being unique. More Eye Candy on the Lakes. Last week (Weds June 9, 2011) we had quite a wicked storm roll through Muskoka. 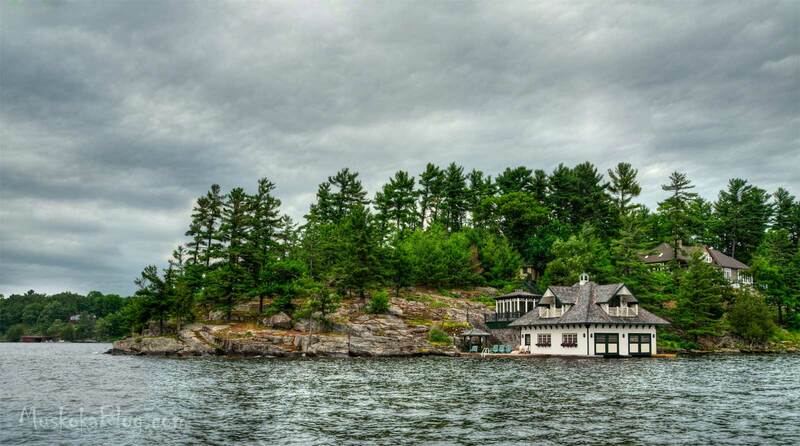 Many trees were uprooted and a few Lake Muskoka cottages and boathouses sustained severe damage. I talked with someone today who was without power for 3 days and another who couldn’t get out of their road for 2 days because of the amount of fallen trees. It’s a different world up here. This is a shot I took just before sundown on Lake Joseph looking towards Crane Island. With the unseasonable weather there has not been many boats on the lakes or people around the towns. Its a bit quiet. Even the real estate market is much quieter compared to previous years. Its funny how the weather impacts our behavioral patterns.